"That is an ongoing topic. I don't think we have gotten to the stage where we'll come out and things like that. I think everybody will have to look at it. I do think personally that there's a need for an educational campaign. I think that there is a lot that people need to know. I don't think the public out there has all the information. I know a lot of people will want to know what is out best case scenario, what is our worst case scenario, where we stand, why it is good, why it is not good? Whatever reasons are out there, needs to come out to light so people can having had that knowledge, having been informed, will be able to make a proper decision. At this point in time I don't think everybody has that information. But nevertheless I think that as time progressed, this thing will definitely be a issue to discuss, because it is a national issue. It is not about PUP/UDP. It is about a national issue for all Belizeans, because a decision must be made and I guess as we progressed with that only time will tell how Belizeans think and how we go from there." 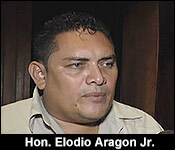 Aragon says the issue will continue to be discussed in Cabinet. 2 registered members (Ken Osterman, Marty), 32 guests, and 7 spiders.